THURSDAY, Nov. 2, 2017 (HealthDay News) -- Hospitals are jumping on a tech trend, enlisting the help of germ-killing robots to tackle a potentially life-threatening but preventable issue: health care-associated infections. For instance, Vanderbilt University Medical Center in Nashville will begin deploying robots this month to protect hospitalized patients from harmful germs, including MRSA (methicillin-resistant Staphylococcus aureus) and VRE (vancomycin-resistant enterococci). The medical center's first inpatient area to utilize the germ-killing robots will be the Vanderbilt Regional Burn Center. After patients are sent home, their rooms will be cleaned with the usual liquid disinfectants and then a robot will be wheeled into the room to perform additional cleaning. 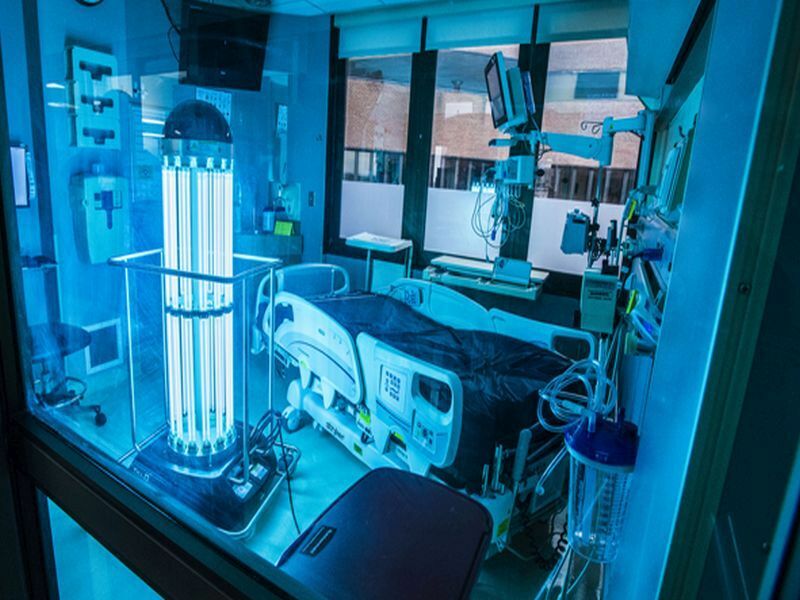 The robot will flood the room with enough ultraviolet (UV) radiation to kill microscopic germs that may still be lurking on surfaces, hospital officials said. "We're starting in the Burn Center because that's a very vulnerable population, and we never want those patients to have trouble with infections," Dr. Thomas Talbot III, a professor of medicine and Vanderbilt's chief hospital epidemiologist, said in a hospital news release. During a robotic-disinfection, the cabinets and drawers in a hospital room are left open while its curtains and hallway doors remain closed. The robot is operated remotely from outside the room. The UV radiation from the robot bounces off all surfaces, decontaminating the environment in about 25 minutes on a normal setting, according to the news release. Higher settings can be used in rooms where hospital-acquired infections, such as C. diff (Clostridium difficile), had been present. The robot automatically shuts off once its sensors detect adequate amounts of UV radiation reflected from a room's surfaces. "For UV to be of benefit, you have to continue to clean rooms correctly and continue to follow all infection-control practices, like good hand hygiene," Talbot said. "We'll be developing protocols to help optimize use of the robots without delaying patients arriving from the emergency department or the recovery room." Vanderbilt plans to monitor the effects of the robots on infection rates as well as workflow. A large study funded by the U.S. Centers for Disease Control and Prevention showed that germ-killing robots could reduce common health care-associated infections by 30 percent. About one in 25 hospital patients acquires at least one such infection on any given day, according to the CDC. The U.S. Centers for Disease Control and Prevention has information on health care-associated infections.